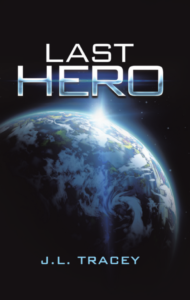 Last Hero series will be a set of books written by J. L. Tracey that at its core is about good vs evil. Yet the story dives into an exciting and original tale of corruption at the hands of the mysterious and sentient force known only as the Shadow. The main character, Slae, is all that is left as the Shadow has mercilessly murdered anyone that could fight back, bringing all of Earth into the waking nightmare of despair and depravity. Slae struggles through learning how to fight against the Shadow, while fighting against the prowls of a second being hidden within himself; always threatening to take control. The salvation of the world sits firmly upon Slae’s shoulders, a burden in which no one else can carry. Even so, our hero is not alone as he finds others who have managed to stay strong against the corruption of the world; giving Slae his greatest strength yet – Hope.